The Swiss Federal Police and the Federal Office for Migration will shortly decide whether the residency permit issued to Igor Kolomoisky to live in Geneva will be extended beyond the current expiry date. Kolomoisky’s permit comes up for renewal in October, and four months of investigation may be required by the Swiss authorities to authorize his stay. Regular reviews of foreign residency permits in Switzerland are required every one or two years, according to government sources referring to Swiss law and regulations. But in Kolomoisky’s case, the Swiss authorities are obliged to determine whether Kolomoisky’s activities since March as the governor of the eastern Ukraine region of Dniepropetrovsk, and a recent Russian indictment of Kolomoisky for war crimes, represent a violation of the rules and disallow him for residency. 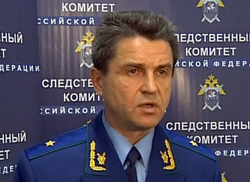 Charged in the Russian indictment with Kolomoisky is Arsen Avakov, the Minister of Interior appointed after the ouster of President Victor Yanukovich on February 21. Asked if the indictment has been filed with the governments of Switzerland, where Kolomoisky has lived for more than a decade, and of Cyprus and Israel, which have issued him with passports, Markin declined to give details; he confirmed that the warrant, plus supporting evidence for extradition, will be filed with Interpol and with the Swiss authorities. Yesterday Markin announced that the indictment of Kolomoisky has been submitted for an initial ruling by the Basmanny court in Moscow. A hearing on the indictment and request for a warrant for Kolomoisky’s arrest is scheduled for the morning of July 2. Kolomoisky may engage a lawyer to represent him at the hearing. If he does not, the court will appoint a public defender. Roman Olearchyk, a Kiev-based reporter for the Financial Times, confirmed in a recent interview at Kolomoisky’s Dniepropetrovsk office that he “resided mostly in Geneva”. Kolomoisky is cited in UK High Court cases as legally “domiciled in Switzerland”. Swiss sources indicate that Kolomoisky’s wife, children and sister, as well as Kolomoisky himself, hold Swiss residency permits. 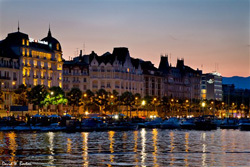 According to Kolomoisky, he bought a house in Haute-Savoie, on the French side of the border, and rented an apartment on Quai Wilson (right) in Geneva. He told the Tribune he had signed a tax agreement to obtain his Swiss residency permit in October 2010 (“Je bénéficie d’un forfait fiscal depuis octobre 2010”). Officials of the Federal Office for Migration (BFM/ODM) in Berne say they “do not comment on a specific person.” According to the Swiss regulations, residency permits for foreigners are temporary, running for one, or a maximum of two years, when they must be reassessed before approval (or rejection) by the BFM. Unlike countries which award long-term or permanent residency to wealthy individuals who meet investment thresholds — $1 million for the US, £1 million for the UK, €10 million for France — there is no permanent residency in Switzerland. To qualify in Switzerland, an informed Swiss source said, a wealthy foreigner like Kolomoisky must pay between 750,000 and one million Swiss francs ($839,000-$1.1 million) in a special tax per year. Ukrainian publications claim to have identified Kolomoisky’s house on the French shore of Lake Leman between Thonon-les-Bains and Evian. The house is reported to be a summer retreat for Kolomoisky who spends the winters at an apartment in Geneva. A background briefing by those familiar with foreign resident investigations in Berne reveals that Kolomoisky was vulnerable to losing his Geneva permit on several grounds before the Russian warrant for his arrest was issued. One has been his appointment in March as governor of the eastern Ukrainian region of Dniepropetrovsk, and the consequent shift of what Swiss officials call the “centre of his life” out of Switzerland. 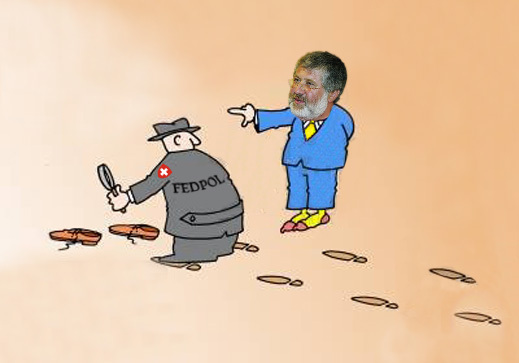 A Swiss source adds that court cases outside Switzerland documenting Kolomoisky’s business conduct, amid allegations of fraud, dishonesty, share raiding, and political corruption, expose him to investigation by the Federal Office of Police (FEDPOL). When BFM reviews a foreign residency permit for renewal, FEDPOL must report what it “knows” about the applicant’s record. A Swiss government source has revealed that currently there are 380 residency permits on issue to high-wealth individuals or their relatives of the Kolomoisky type. The BFM regulations governing them can be read here. Kolomoisky comes under Section 5, Wichtige öffentliche Interessen (“Important Public Interests”). This sets out guidelines for what is acknowledged to be an “uncertain legal concept”. The rules allow the Swiss cantons – in Kolomoisky’s case, Geneva – to accept from abroad recognized artists, state-endorsed figures (politicians in exile, ex-prisoners like Mikhail Khodorkovsky); and finally, individuals with enough wealth to enrich the cantonal treasury. The last category is referred to in the regulations as erhebliche fiskalische Interessen (“significant financial interests”). Swiss sources concede that this, too, is up to the canton to calculate and endorse in an application, which then goes to BFM for assessment. Both the canton and BFM may exercise considerable discretion on what evidence to test in the process, and what to accept. The applicant must undertake to pay an agreed amount of annual tax, called the pauschalbesteuerung (“lump sum tax”). Although this is formalized in an agreement between the foreigner and the Swiss tax authorities, it is more a fee for residency than a tax. No disclosure of income or asset value is required, and none is audited. When BFM investigates a foreign resident’s renewal application, he must be current with his annual payments. Also checked is whether he is “integrated” in Switzerland: this is another ambiguous concept not defined in the regulations. It requires the resident to be making Switzerland “the centre of his life”, but he is not disqualified for spending work time abroad. In Kolomoisky’s case, if he tells BFM that his political role in Dniepropetrovsk is temporary, and that he will resign the governorship as soon as the new Poroshenko administration establishes itself, the Swiss are likely to accept that the appointment is not a violation of the residency conditions. Kolomoisky told the Tribune de Geneve he didn’t anticipate taking, and didn’t want the role of regional governor, but he had decided to “act in order to calm the political situation” – “Rinat Akhmetov should go to Donetsk, Victor Pinchuk to Zaporozhiya, and me to Dniepropetrovsk. Russian and Ukrainian media reports are currently claiming that Kolomoisky has already left Dniepropetrovsk for Geneva. A FEDPOL investigation may be more problematic, Swiss sources intimate, because the standard of evidence is less stringent than would be required to substantiate a Swiss prosecution, a criminal conviction or a civil liability judgement in an international court. According to the Swiss commercial register, Kolomoisky directs two local entities — the European Council of Jewish Community (ECJC), where he has been chief executive since April 2013; and the European Jewish Union (EJU), where he has been president since June 2012. According to Jewish media reports, infighting at the ECJC was triggered by an attempted takeover by Kolomoisky in 2010. Opposition to that among ECJC members led to his exit. Kolomoisky then formed the EJU. This too is controversial among international Jewish organizations which have disputed the EJU’s claims to conduct elections and represent the Jewish community. Since March 15, 2011, the EJU has been registered as doing its business out of the Geneva office of Firex Audit & Consulting at 14, rue de Mont-Blanc. Myles Tweedale Stott, 72, a British national, accountant, and private company front-man, is registered as the chief executive of Firex, whose Swiss registration dates from 1999. A Geneva investigator describes Firex’s role: “They take the letters out of the mailbox every morning and put them in a bag with Kolomoisky written on it. A lawyer comes every two weeks to pick up the bag. Firex is one of many corporate entities for which Stott is recorded as the director of record. Another investigator has turned up records of past financial misconduct allegations involving Stott, including this Jersey court action for fraud, and this Indian one for bribery and money laundering. Polish sources claim a Central Bank of Poland investigation of Kolomoisky in 2003 and 2004 turned up evidence that led the Polish authorities to deny a banking licence to Kolomoisky’s Privatbank. A Warsaw consultant to Privatbank during that process claims there was also a falling-out over tactics between Kolomoisky’s bank and the Polish law firm it hired to promote the licence, SK&S. A recent investigation of Kolomoisky’s business conduct by the Zurich newspaper Tages-Anzeiger reports allegations from Swissport, the operator of airport services for aircraft, cargo movement, and passenger handling, that its multi-million dollar investment in Ukrainian airports was the target of a hostile takeover with Kolomoisky “in the background”. Swissport alleges it has also been the victim of improper manipulation of the Ukrainian courts after it filed suit for protection of its assets. Tages-Anzeiger does not report a response from Kolomoisky to the allegations from Swissport management. In the UK High Court records for 2013, Kolomoisky responds to a claim for asset recovery and compensation by Victor Pinchuk, a fellow Ukrainian oligarch and one-time business partner. Kolomoisky says through his lawyers that in return for control of Ukrnafta, a Ukrainian oil and gas company with partial state ownership, he had agreed to pay $100 million into a special fund for the re-election of then-President Leonid Kuchma, Pinchuk’s father-in-law. The payments were made, Kolomoisky says, between April 2003 and September 2004. The Kolomoisky submission to the High Court, dated September 27, 2013, can be read in full here. The political financing scheme is described at Sections 35 to 42. Pinchuk’s claims initiating the lawsuit, including references to meetings reportedly held in 2006 and 2011 at Kolomoisky’s “offices in Geneva”, can be read here. The High Court story can be followed here. In May of this year, in an unrelated case, the UK Court of Appeal ruled to uphold a 2013 High Court judgment and judicial orders in relation to a shareholder conflict at JKX Oil & Gas Plc, a London-listed company with assets in Ukraine. Kolomoisky is one of several shareholders in JKX, who has been accused of share raiding. The court rulings cite Kolomoisky for company law violations, financial manipulation, improper concealment, and making false statements. Kolomoisky was asked through Privatbank and the governor’s office in Dniepropetrovsk to say whether his activities in Ukraine comply with the Swiss residency rules, and to respond to the Russian indictment charges. His spokesmen were also asked to comment on the speculation that he has left the governor’s post. There has been no reply.